There is widespread reporting online, on broadcast and in the papers suggesting that Cabinet has decided to give no special treatment to EU migrants post-Brexit. 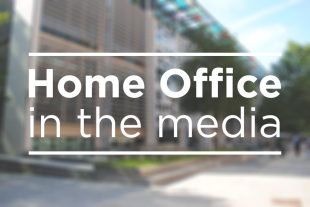 The Home Secretary is reported to have told colleagues yesterday of plans to reduce the number of low-skilled workers coming to the UK in an overall plan to open up the UK to skilled migration from around the world. Professor Alan Manning, chair of the Migration Advisory Committee, which last week recommended a global migration system with no caps on high-skilled workers, also attended the Cabinet presentation. The Telegraph reports that Britain has granted asylum to 29 Syrian “White Helmets” civil defence volunteers and up to 70 family members. According to the article, the first family has already been resettled in the UK, while the rest are due to move early next month. It notes that a total of 98 White Helmets and 324 of their relatives were rescued from southern Syria through Israel to Jordan in July. The unprecedented rescue mission was conceived by Britain, Germany and Canada, and supported by Israel, Jordan, the US and the United Nations (UN), the paper reports. The Home Office, Foreign and Commonwealth Office and the Department for International Development have published a Gov.uk story. The Home Secretary’s statement is below. “White Helmets volunteers saved the lives of thousands of innocent civilians during the Syrian conflict and suffered terrible losses in the process.